CORE PC helps an organisation to assess the quality of its service by storing CORE system data, then analysing it and generating customised reports. Launched in 2002, CORE PC has been developed around the needs of users and offers powerful support directly to all types of service. Loading. For those using a paper-based system, data is loaded manually. 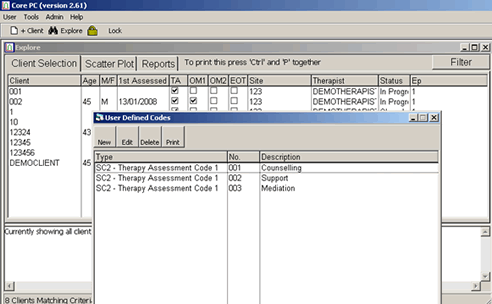 Individual client/patient data can entered into CORE PC either by the therapist or it can be centrally from CORE system forms submitted by therapists. When CORE PC is being employed as the in depth analysis tool for CORE Net, data is exported and downloaded direct from CORE Net, although manual entries can still be made. Networks. CORE PC can be used on a single PC or networked across a service, which allows data to be entered and analysed across a range of sites and practitioners. The data can then be explored at the level of the individual client or patient, or at a service level to assess a range of service quality indicators such as waiting times, intake into therapy, risk assessment, therapy endings and improvement rates. Reports. CORE PC's functions include a powerful report engine which can generate reports on overall service data and allow supervisors to drill down to any level to answer specific questions. 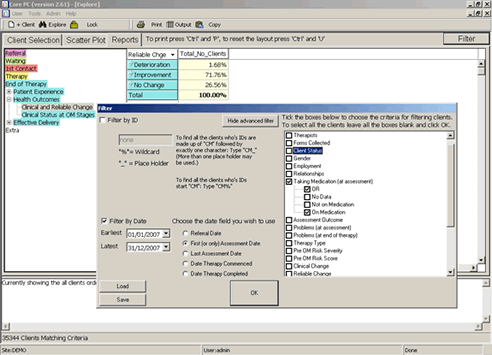 Reports can be chosen from various headings to provide graphical representation of results and these can be filtered as required to export subsets. Data screens are clear, easy to follow and match the CORE system forms to offer instant familiarity. Data can be entered into CORE PC from the forms, or directly by the practitioner. 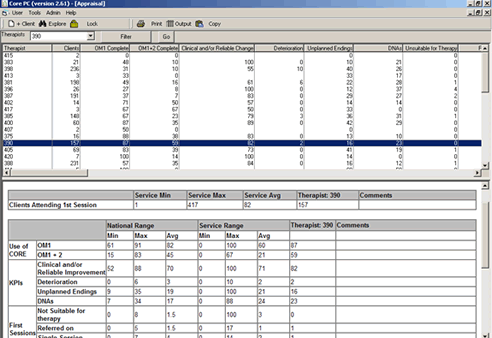 CORE PC provides instant visual summaries of a client's score, displayed alongside 'norms' for clinical population cut-offs to help therapists assess severity levels. CORE PC allows you to capture not only pre and post Outcome Measures but also interim measures which may, for example, be completed at review sessions. 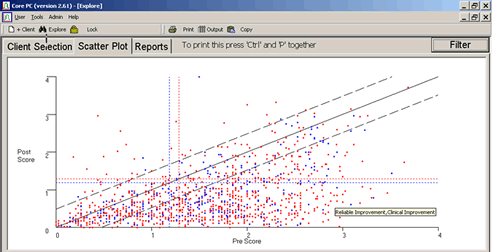 CORE PC's scatterplot shows the change in scores for each client with a pre and post therapy measure, represented by a dot on the screen. On-screen markers shows whether change is clinical and/or reliable. The scatterplot is interactive - each client's case can be immediately reviewed by selecting and a clicking on the relevant dot and drilling down to their individual data. 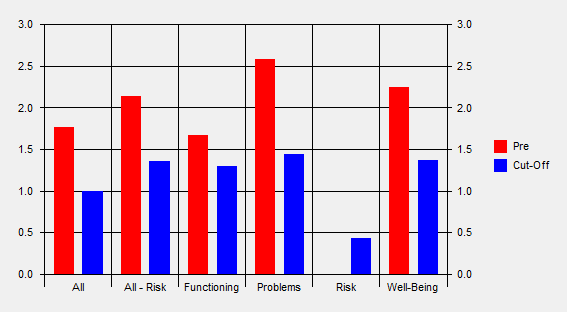 Service user characteristics and a range of service quality indicators, including waiting times, intake into therapy, risk assessment, therapy endings and improvement rates, are profiled in some 40 reports generated by CORE PC. Reports are structured in a way that mirrors client pathways into and through therapy services, their experience and the benefits gained from the process. They reflect key NHS performance assessment requirements and quality domains, to enable services to identify their own performance against a range of key service quality indicators. CORE PC's advanced filtering capability enables specific sub-sets of service data to be analysed. For example, the service may be interested in the relationship between medication and improvement rates, or the number of sessions attended by users with different levels of risk severity. Date filters provide a way of identifying trends in service performance over time. 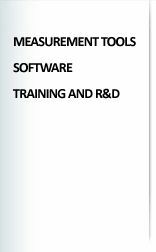 Used together with CORE benchmarks these can help to identify areas of strong performance and priorities for service development. 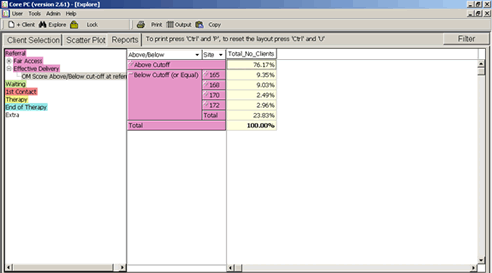 Reports from CORE PC can be copied into other applications, for example Microsoft Word or Excel, to produce tables or charts which can be used within service reports. CORE PC can be configured by the user to identify sub-sites - for example GP practices or customers - as well as individual therapist identifiers. A range of service specific user codes can also be defined to enable the service to capture categories of data that are unique to it, for example, to distinguish specific categories of referrer or types of intervention. Sub-site, therapist and the service's user defined codes all appear in CORE PC's filter structure, enabling exploration of this service specific data at a high level of detail. CORE PC's appraisal function contrasts the performance of the service against a set of sample benchmarks, and that of individual therapists with overall service performance. Data from the therapist appraisal function is valuable in helping services and practitioners to identify excellence in practice and further the development of professional practice.